← Where are the blackberries? 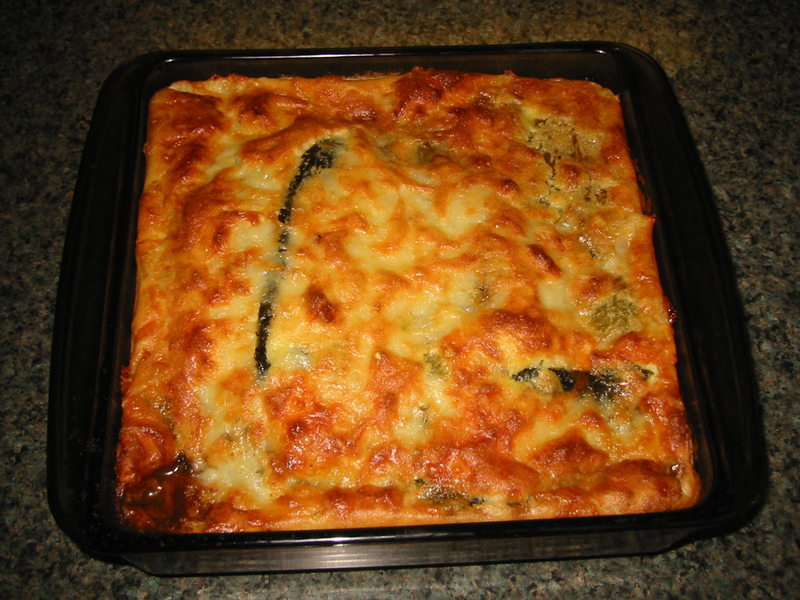 Relleno Casserole. 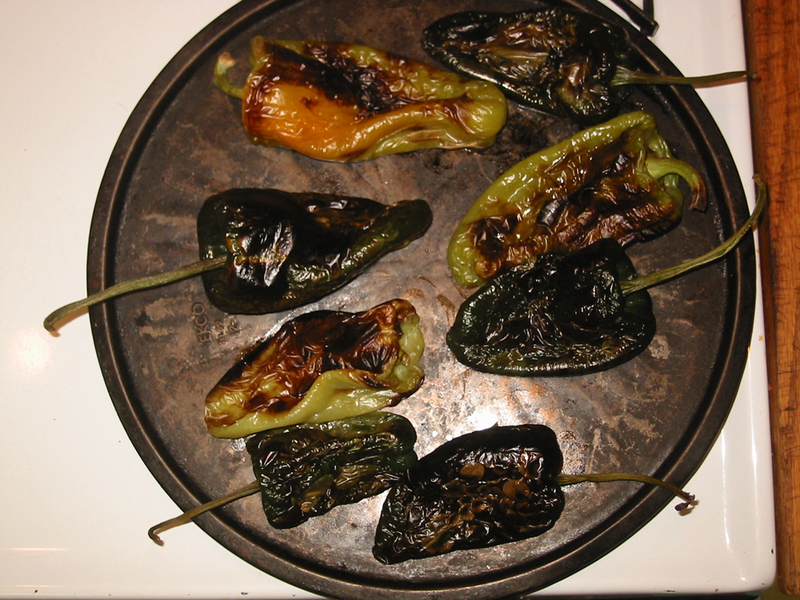 The process isn’t difficult, but it does take time to roast and peel the chiles, and to remove the seeds. Other than that, the dish is a snap. Very delicious! To roast several chiles, I prefer the broiler. Lay them out and turn them several times till they are charred almost all over. This took about 30 minutes. Put them in a covered container till they are cool enough to handle. (While they cool, you could grate your cheese and measure the other ingredients.) When they are cooled off, peel off the tough skins and open them up to remove the seeds. 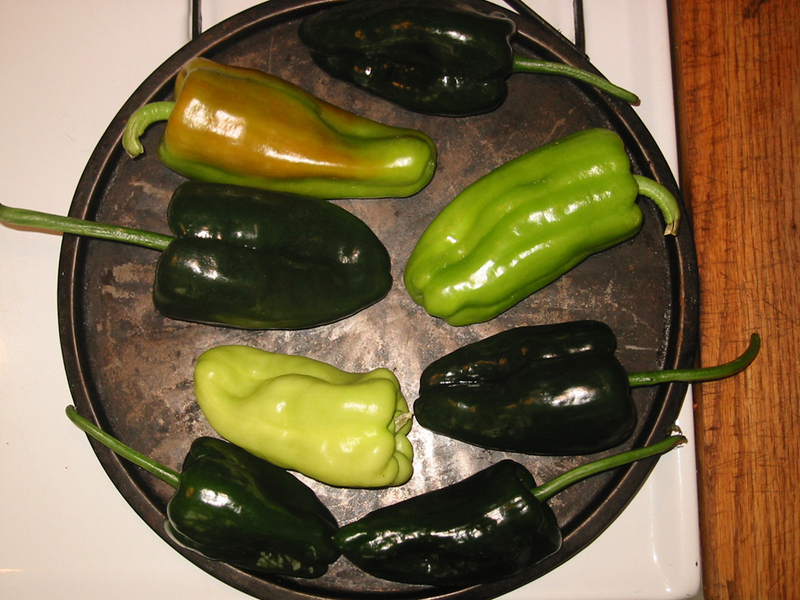 If you are using peppers with some heat, use gloves so you don’t irritate your skin with the capsacin they contain. 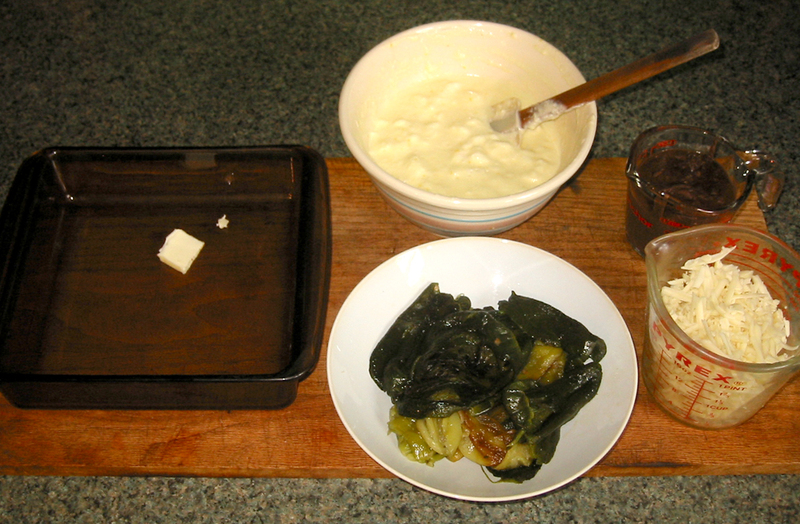 When you have prepared the peppers, separate the eggs and whisk half the buttermilk into the yolks. Add the flour and whisk till it’s smooth, then whisk in the other half of the buttermilk. Beat the egg whites till stiff and fold them into the yolk mixture. 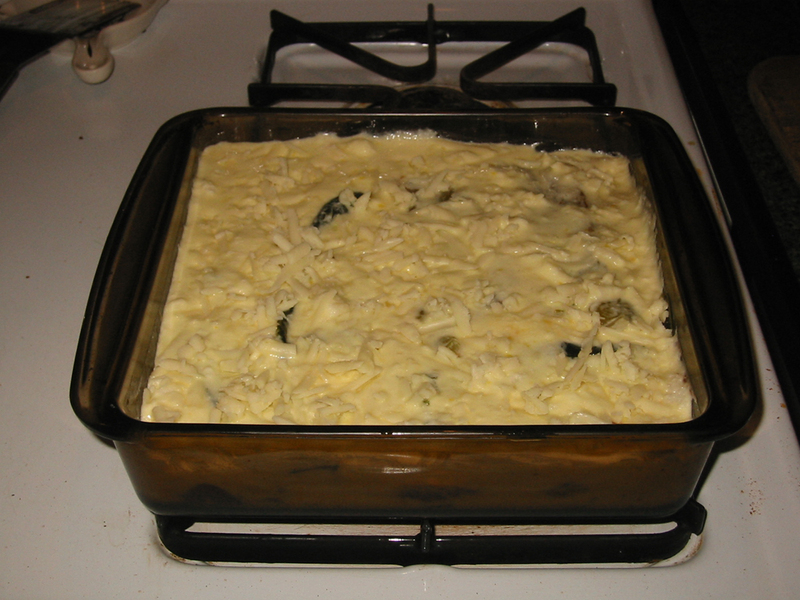 To assemble the casserole, layer the peppers, the cheese, and the batter in an 8×8 baking pan. I added dollops of refried beans to make it more substantial. (I think chilies rellenos sometimes have beans inside.) End with some grated cheese on top and bake at 350 degrees for 45-55 minutes. It will be very puffy when it’s done, and the middle won’t jiggle much at all. When it cools it will fall back down. Here are some photos of the process. Chilis ready to roast/broil. The dark green ones are poblano peppers, the others are assorted peppers from the Parsons Farmers Market, wednesdays from 10am to noon at Mill Race Park. After roasting. These need to be placed in a covered container for about 20 minutes then peeled and deseeded. Ingredients assembled. The pan with some butter, batter, the peppers, a cup of black beans, and 2 cups of grated sharp cheddar. Ready to bake at 350 degrees for about 45-55 minutes. Baked golden brown. It puffs up in the oven, then fall as it cools. Served with a tomato salad. Whisk egg yolks with half the buttermilk, then whisk in the flour and the rest of the buttermilk. Beat whites till stiff, then fold into yolk mixture. Layer ingredients in a buttered 8 x 8 inch baking pan. Bake 350 degrees for 45-55 minutes. Mimi Kibler and her husband Alain Kieny live in Parsons, West Virginia. In 1997 they founded LaFontaine bakery to supply the area with hearth baked breads and other treats. Her mother taught her the wonder of food and cooking. French master baker Didier Rosada taught her traditional european sourdough techniques. She is an enthusiastic gardener, birdwatcher and home cook who loves trying new and exotic foods. This entry was posted in Entrees, Recipes, Uncategorized and tagged poblano chiles, roasted peppers. Bookmark the permalink. I love chili rellenos! But you’re right, they are a hassle to make – can’t wait to try this recipe! Hope you like it, Terry! I would use almost any peppers to make this if I didn’t have the poblanos. I think it would be great with roasted bell peppers if you add a couple jalapenos for the heat. Thanks! The poblanos were gorgeous! 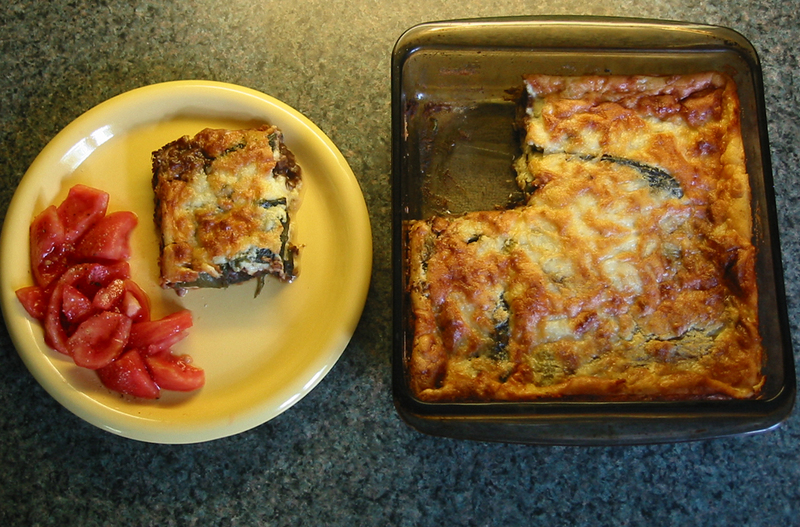 I had forgotten about this recipe and how many peppers it call for– twelve! I only bought 5, but luckily I had a few other peppers to add. The Elkins Farmers Market is lovely. I recommend subscribing to David’s email if you live near Elkins. oh yum- what a great looking dish! These look hungry husband- approved. There is a farmer’s market at the Trail Mix in Canaan Valley this Saturday- hopefully I can get lucky with some poblano’s. I just tried to eat it off of the computer screen. I still imagine it tastes amazing. I’m smiling! Wait till you see the post on smoking salmon on the kitchen stove.